If you own a brick-and-mortar business, or are thinking of setting one up, you’ve likely seen plenty of reports that imply the future of shopping is online and that it is also “mobile.” You’re right to be concerned about what this means for your business, but perhaps not in the way you may think. Firstly, the idea that we can know with any certainty what the future holds, no matter how many industry reports we manufacture, is ridiculous. This is precisely why putting all of your eggs in one basket is an extraordinarily bad idea. Which brings us back to the question: What is the future of retail? Or, how can you best prepare for it? At the close of 2013, Amazon reported holiday season sales were at an all-time high with more than 36.8 million items ordered worldwide on Cyber Monday alone. Of those orders, more than half were placed on a mobile device. And, according to Internet Retailer Magazine, in the fourth quarter of 2013, online shoppers spent $69.2 billion. In 2012, they spent $59.6 billion, which equates to a 16.1 percent increase in sales. What does this mean for you? Does it mean that your real-life store model is doomed? Should you be switching to an online version of your store? Should you abandon the desktop version for a mobile version? Should you continue to run both? While there is no denying an increase in purchases that take place on connected devices or that are driven by them, you’d be making a huge mistake if you opted for an “ecommerce-only” strategy based on the data alone. 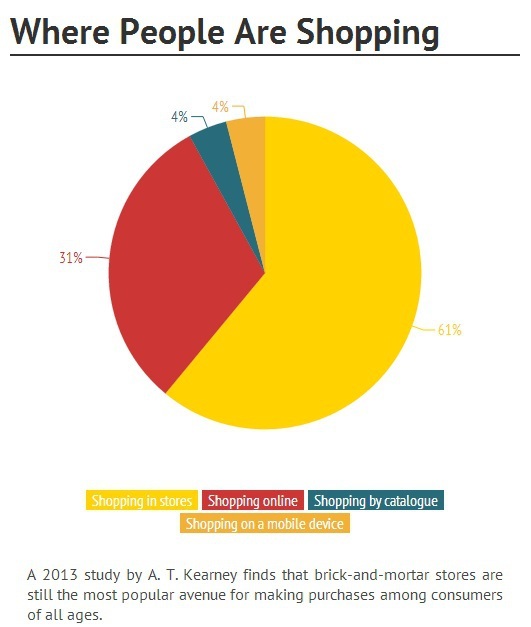 Contrary to what the media repeatedly tells you (“online is the only way forward”), a 2013 study by A.T. Kearney found that brick-and-mortar stores in the US and the UK are still more frequented than online stores. According to more than 3,000 consumers surveyed, 61 percent say the majority of their time is spent shopping in stores, 31 percent online, 4 percent by catalog, and 4 percent on mobile devices. So, while online sales have continued to grow across the globe over the past few years (they only account for about 6 percent of all retail sales), the fact that people still do real-life shopping, suggests that there is something about the experience of browsing and making purchases in person that is still attractive. This means that the model isn’t dead yet, and you’d be a fool to ignore it if it’s right for your industry. Shopping is a social experience. You do it with your friends and family. You do it to give feedback and to get feedback. You do it to spend times with others, while fulfilling your own needs and as you complete chores. Shopping is a visceral experience. Seeing, touch, tasting and smelling things is something that we just can’t do online yet. Until that day comes, real life stores will one-up the internet in this realm. Try before you buy. No need to worry about mailing clothes back, about printing return labels and about no-return policies because you purchased online. Instant gratification. If you want it, you can have it. By it, take it home and use it immediately. Great to know, but, how do you deal with those people that are combining the two experiences—using phones to comparison shop, asking for friends’ opinions by taking a photo of your product and uploading it to social sharing sites, trying products in your store so they can buy them online later? Won’t they impact the future of how well real-life stores perform? It’s true that if you want to keep your slice of the pie, you may need to make a few changes. In reality, opting for either a brick-and-mortar store or an online store is not an approach that will safeguard you from future catastrophe. For that matter, neither is signing up to run both in the same fashion. That’s a recipe for disaster. Which brings us to our answer and the conclusion of the A.T. Kearney study. The future of shopping, more than anything else, is omni-channel. What is omni-channel retail? PS: We didn’t make it up. This means that you will use multiple channels (computers, brick-and-mortar stores, direct mail, catalogs, mobile devices, etc) to create a seamless consumer experience. Going forward, this is the strategy that you need to adopt. 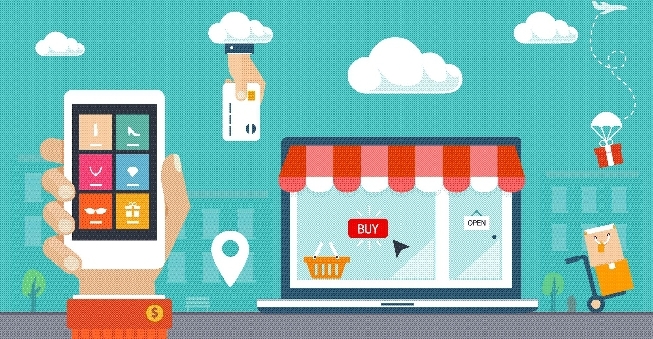 Are you ready for omni-channel retailing? An omni-channel approach to marketing will allow your audience to engage with your brand as they choose: when they want, where they want and how they want. This flexibility doesn’t just make you a “pleasure” to deal with, it fosters a positive relationship between you and the consumer. Optimize locations based on new shopping behaviors. How are your customers behaving as they shop? Do they like to pull out their phone and do a price comparison? Do they take a photo with your product and upload it to Instagram? Do they call someone to ask for advice? Once you understand more about their behavior, optimize your locations to make the most of it. If people enjoy shopping with their phone, offer them a discount they can only get if they scan a code and subscribe to your mailing list, or perhaps, if they buy the product in-store, be entered into a competition to win something. There are many things you can do to take advantage of this. Innovate. Stop looking to everyone else for ideas. Come up with your own strategies to keep people buying. You will likely need to encourage a mix of mobile, web and in-store actions. You might direct people to your real store store via an online promotion. One restaurant-store in my own town, Eugene, Oregon, has this approach down to a T. The Bier Stein lets you text your order to the kitchen. They then bring it directly to your table, no waiting in lines and no waiting on the waiter. They also have a ‘real time’ tap list that is constantly evolving. If you’re a beer connoisseur and are looking for something specific, you can check the real time feed, or subscribe to their twitter account so you don’t miss your favorite beer going on tap! Integrate all of your operations across channels to create a channel-less operating model. In simple words, ensure that if someone wants to buy something in-store, they can use a discount they receive online. If someone is following your business on a social media site, your offers are available to them in-store. If someone want to order something online, they can pick it up in-store. 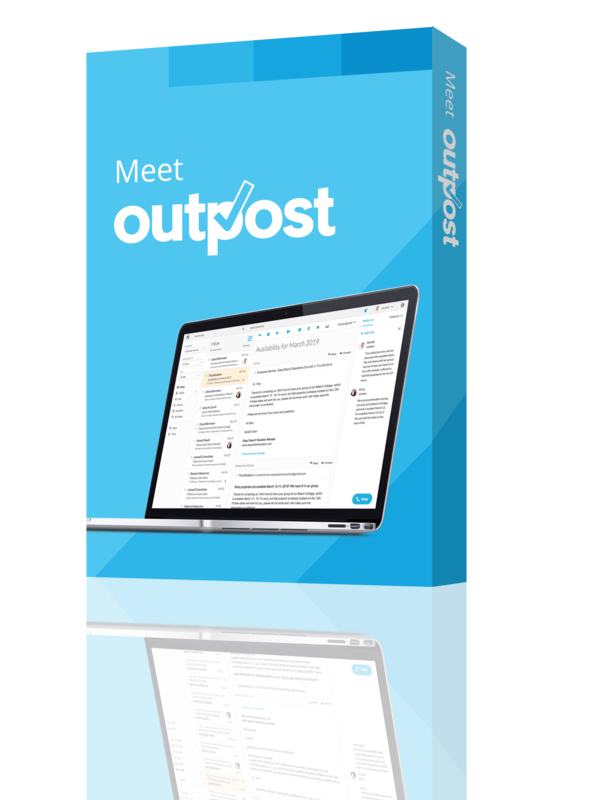 In simple terms, it’s an approach to selling that involves the seamless use of multiple channels. In an omni-channel approach to retailing, merchandise and promotions are not specific to any one channel. Each operations channel is a part of the supply chain, enabling customers to communicate with the company in a number of ways. Omni-channel retailing usually requires the use of real-time data in order to meet customer expectations. If someone adds something to their shopping basket from within an app on their phone, when they log on to their computer later, they expect to find the item still in the basket. It also implies a certain level of personalization, tailoring marketing to a consumer depending on their location, purchase patterns, social networking affinities and more. A 2013 report by MIT found that the omni-channel consumer—YOU—is the primary force shaping the future of retail. Omni-channel consumers expect information to be at their fingertips wherever they are. Data from the report shows that consumers are indeed approaching the shopping experience from multiple angles: 80 percent of shoppers check prices online, and one-third of those shoppers do so while browsing in an actual store. And…just for fun, here’s a glimpse of retailing in 2020. Hint: omni-channel is at its core! If you enjoyed the article please do share! If you’ve got any advice of your own to offer our readers on going omni-channel, what is it? We’d love to hear from you in the comments section below. I will personally take the time to reply.